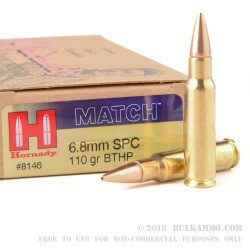 These match-grade rounds from Hornady are ideal if you plan on taking your 6.8 Remington SPC AR-15 to a competition or a hunt. The 110 grain boat tailed hollow point boasts exceptional accuracy, leaving the barrel at 2,570 feet per second with 1,613 foot-pounds of muzzle energy. 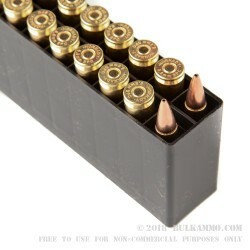 Each round in this box of 20 uses Boxer-primed brass cases. 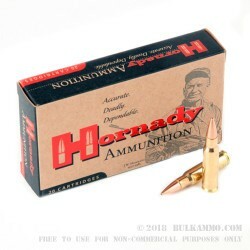 Hornady is a manufacturer of premium ammunition based in Grand Island, Nebraska. Founded in 1949, the company gained its fame producing high quality bullets for hunters. 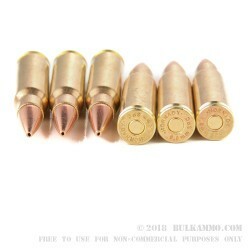 In the 1980s, the company began selling its own loaded ammo in addition to supplying other loaders and found significant success in the law enforcement and self defense markets with its high quality hollow point ammo. The company’s current CEO, Steve Hornady, is the son of founder J.W. Hornady. Q: Are these loaded for shooting targets or would they be a viable Whitetail round? A: This 6.8 SPC ammo would definitely be viable for hunting whitetail deer. The terminal performance of the 110gr BTHP projectile is very good within 150 yards.